I built the mainline only to Personhood. What's farther oop North isn't "my" in any capacity. Also I'd like to point out that the system notably lacks East-West mainlines. With few exceptions, we mostly have North-South tracks, and some diagonal chords. Which means that to get from one peripheral location to another, people would likely have to take a train through the center of the map and then change to another. Also it creates sort of a choke-point cluster in the center. Last edited by h-v-smacker on Wed Jan 16, 2019 12:05, edited 1 time in total. Oh, then I misunderstood this. In this case, we'll probably extend E1 up there. And yes, the inexistence of east-west mainlines is a long-persisting problem on the server. However, there are no interesting places yet right west of spawn, so we don't need them yet. And has anyone else noticed that Euler Street is almost totally useless? Orwell, I dislike you unilaterally declaring a network plan. That's what the Linuxworks Dept. of planning ( https://bugs.linux-forks.de/planning/ ) is for, so players can discuss the proposals. 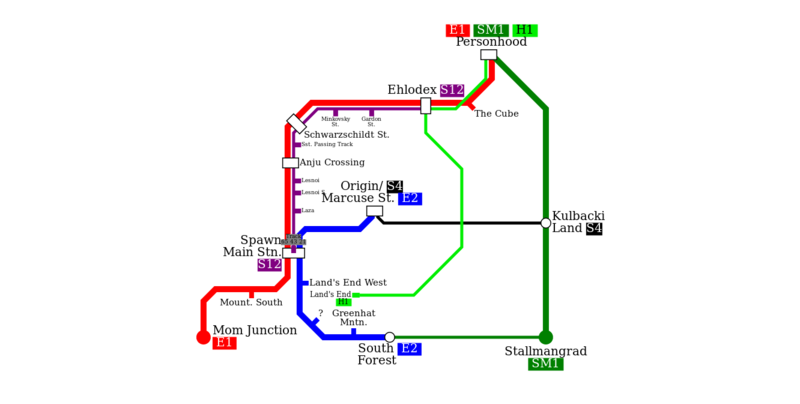 Euler street is meant to serve trains to Melinka, Shanielle Park and Garden of Eden. I`m sorry that this has led to misunderstandings. This plan reflects my personal opinion, and I didn`t mean to enforce my opinion on you. As I wrote Och_Noe today by e-mail, I put this in here for you to discuss, and not to "declare" it. I should have clarified this in the post. Sorry for that. - The coupling of trains now works like it should and is no longer buggy. - All existing ATC and LuaATC setups still work like before, you don't need to change anything. - During the update, about half of the trains changed their driving direction while retaining their speed. (this was an inevitable result of a change in the save mechanics). This means, you will possibly need to re-start your automatic lines, as train jams may have occured. This is a one-time effect and will not re-occur. - It is now possible to utilize the interlocking system. Requests for the appropriate privilege can be directed to qualified moderators. The privilege will only be given out to trustworthy players. Due to the event described above, pretty all railway lines, including the subway, are currently out of order. We are going to make them work again in the next few days. I have already restarted Line 2a (Origin<>Edenwood), to confirm that everything works. If you notice any bugs or problems with trains now, please report it on http://bugs.linux-forks.de/advtrains. — The trains either brake at a lower rate of deceleration, or react with a delay. As a result, trains on my routes now stop several blocks farther than where they used to (and were supposed to). Sometimes the trains even overshoot the platforms by several blocks. — I lost two shunters when taking them off the tracks. Literally nothing given back. Same with a yellow subway wagon, no iron, no nothing. Apparently the "giving back" mechanics is completely broken. Previously it gave back nothing only when your inventory was full (which is also a bug), now it gives nothing at all times (which is a superbug). — Placing advtrains:subway_train on tracks makes advtrains reset itself, no train is actually placed. — If you assign a signal to a TCB, and then destroy the TCB (that is, before creating a section, or after deleting them), then clicking the remaining signal causes a crash. — If you destroy a TCB while it's still a part of some route, clicking on signals involved in that route also causes a crash. h-v-smacker wrote: — The trains either brake at a lower rate of deceleration, or react with a delay. As a result, trains on my routes now stop several blocks farther than where they used to (and were supposed to). Sometimes the trains even overshoot the platforms by several blocks. The acceleration/brake dynamics should not have changed, and I don't know what the cause of this could be. Is it a problem for you to readjust your appliances, or are you OK with it? Hm, I considered it a bug, and more than one player asked me about why it is this way. I'm afraid I can't make this bug reappear quickly. What I mean by this is something different. Interlocking follows the principle that between two trains, there has to be a red signal. To set a route, the full route (up to the next signal) needs to be free of trains and other routes. However, another route that only uses the rear part that the train has already passed can be set. See the image as illustration. I've fixed the other problems you reported. Thank you a lot. orwell wrote: The acceleration/brake dynamics should not have changed, and I don't know what the cause of this could be. Is it a problem for you to readjust your appliances, or are you OK with it? orwell wrote: Hm, I considered it a bug, and more than one player asked me about why it is this way. I'm afraid I can't make this bug reappear quickly. orwell wrote: What I mean by this is something different. Interlocking follows the principle that between two trains, there has to be a red signal. To set a route, the full route (up to the next signal) needs to be free of trains and other routes. However, another route that only uses the rear part that the train has already passed can be set. See the image as illustration. Ok. So it follows then that in order to allow trains to move with short intervals (like on a track with regularly placed block signals in OpenTTD), such chained routes should be avoided? So if I have a long chain of segments, and I want the trains to move forward once the preceding train advanced to the next segment, it should go S1 -R1-> S2 -R2-> S3 -R3-> S4 ... and not S1 -R-> S2 -R-> S3 -R-> S4 (Sn = signal, Rn = route)? I.e. there should a separate route inside every segment, not one big route linking several segments? What is the use-case for a route spanning several segments then (excluding passing several segments with track switches, of course)? orwell wrote: I've fixed the other problems you reported. Thank you a lot. PS: with respect to destroying wagons, there is another oversight: you can destroy freight wagons that have something inside, and the contents simply get destroyed. There appears to be a bug in the execution of automatic brake commands. This applies to both the ATC "B" command and the train safety system (LZB) that makes trains stop in front of signals. EDIT: The bug regarding LZB seems to be fixed. Time will show whether the other problems still persist. Keep in mind that trains stop about 2 nodes in front of the signal influence point. Last edited by orwell on Wed Jan 23, 2019 23:34, edited 1 time in total. The question is where the 3 blocks come from. Have you measured how big the distance is? If it really is the globalstep, the distance should be about the distance the train runs in 0.1 seconds. The debug output saying "step_dist" tells the distance the train moved in the last step x1000. However, the 1 step between "ATC command received" and "start braking" existed already in master. The dtime used to be 0.09, so that might be the difference. Today I pushed the "point speed restriction" rails and the first version of the "stop rail" that is supposed do successively replace ATC-based railway operation. Since my exam period approaches, I will from now on only fix bugs found in the advtrains TSS version. I will then officially release tss as stable once it has proven working on this server for 1-2 weeks. I won't have much time to play MT over the weekend. Have a nice weekend. Thing about ARS: the preemptive path reservation should be possible to disable. Consider the signals around a station in outbound direction: if they are close enough to the point where the train stops, they are toggled when the train just pulls in, preventing any train from the opposite direction to pull in as well. Granted, this isn't much of a problem when the trains stop for 10-20 seconds at a time. But what if a train is sitting in the station for several minutes? On the other hand, if the train were to reverse and pull out the way it came, the exit signal in _that_direction would only be toggled when needed. It would be beneficial to have a setting in ARS rules (like some NP flag) saying that the path should only be reserved when the train actually passes the point of influence. After all, this setting is needed only for cases of low-speed approach, so the train won't miss the signal, as there will be plenty of time to react. This way, you won't have to place exit signals far from the station to avoid paths being reserved way too early. I already made a draft of a timetable system that would allow for sophisticated train operation. But I think I won't get to implement this in the near future. I don't think that a slight delay until the path is freed is really a problem. Outbound paths should be rather short, as a rule. It's not going to be worse than in the current subway system, where trains sometimes wait in the tunnel. In my opinion, preemptively blocking the path without immediate intention to use it is a much more troubling issue. It prevents a station from working at full capacity. Having an ATC command for ARS control would actually be a nice solution as well... because then it would be possible to control when the train actually requests the route (In my use case, I would obviously put it after closing doors/reversing, right prior to departure). So the train would first disengage from the ARS and pull in, and later engage the ARS and pull out. On stop tracks: they should be able to differentiate by LN/RC. That way it would be possible to arrange different behavior for various trains on the same track. It would be very helpful if some could be reversed while others left running in the same direction. On TSS/ARS in general: it should be possible to tie Andrew's Crosses to a track segment, so that they engage when it is occupied. I think that's the last "big thing" missing. Also on usability: there should be two buttons to set route instead of one: "Set route" and "Set route and enable automatic working". When you set a lot of simple block signals, this improvement will cut down the amount of clicking and mousing drastically. The first thing is exactly what I had planned, and what I will do next. 1. Level crossing is integrated into the signal box, working similar to route locks. (Crossing closes when route is set)-> useful for crossings near stations. This is already possible in a limited manner. 2. Crossing on running line: This only needs to be closed while a train is approaching. I hadn't thought about how exactly these should work. Just connecting those to the "blocked" state of a section seems like a simple yet good idea. I thought about adding a simple "Level crossing controller" node that is simply a "setstate multiplexer", so it is easy to add more Andrew's crosses without changing all routes. That could also serve as controller for 2.
orwell wrote: The first thing is exactly what I had planned, and what I will do next. I honestly don't see a need in some fancy mode. If the track sections around are very long (hundreds of meters), the crossing can just be arranged within its own shorter section. What would be handy, however, is an ability to connect a crossing sign to more than one track section, activating it on any of them being reserved, and deactivating on all being clear — to account for parallel tracks. PS: A note on using on-board computer to set routes. It's impossible to do, it seems, when there is a route that is set by ARS (default, or matching LN/RC). If there is just a bunch of routes, the driver can pick any. If none of the routes are activated by ARS, same. But if ARS wants to assign a route, there is no way to overpower it but to get out, walk to the sign, and set a route that you want. If you try to do it from cabin, the ARS will re-set the route it wants before you can press the buttons to set another. The server puts a lot of focus on trains, and the machine world (mesecons, pipeworks, digilines ...). I really appreciate the fact that Linuxworks has no mobs, but perhaps make it a bit easier as well, by making lava kill a lot slower, and adding a Hazmat suit for radiation. This would put even more focus on trains and machines, and keep the focus off of looking for bones. The server lag is really more than usual, even my ssh no longer works. I got to find another mapping schedule that will hopefully not wreck the server. I couldn't connect even when the server was empty. One thing is strange here: The mapping lag is each time different. Sometimes it's soft and sometimes it's terrible. New interlocked lines have opened.... They are in testing operation right now, but they seem to be working fine. The light green line is roughly outlining the course of the lines in gpcf's map. You need to merge both maps in your mind to get a complete map.